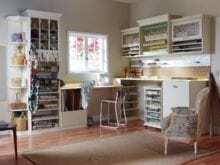 Personalized storage paired with accessories and unique design details balances the needs of both creativity and utility—resulting in an organized and happy place for crafting and hobbies. Each California Closets system comes with a limited lifetime warranty that covers any substantial defects in materials and workmanship for the life of the product as long as you own your home. Not only do we customize your storage solution to your needs and budget, we tailor the installation process to your life. We work within your schedule and on a timeline that is best for you. During installation we treat your home as our own, and we’re always available for service for the lifetime of your system. We customize solutions to any space and any budget. The cost of your storage solution depends on the complexity of the design and the materials you select. Find out how it works. A central workspace provides room to spread out projects or collaborate. A fusion track wall system organizes small items such as wrapping paper, scissors, tape, buttons, ribbon, and other small crafting supplies while keeping everything visible and easily accessible. Drawer dividers and accessories keep stored crafting supplies organized and discoverable. Lower desk cabinets conceal supplies and technology, while upper storage cabinets allow for easy access to supplies. A variety of drawer and door styles allow you to further customize the space to your needs and design aesthetic. 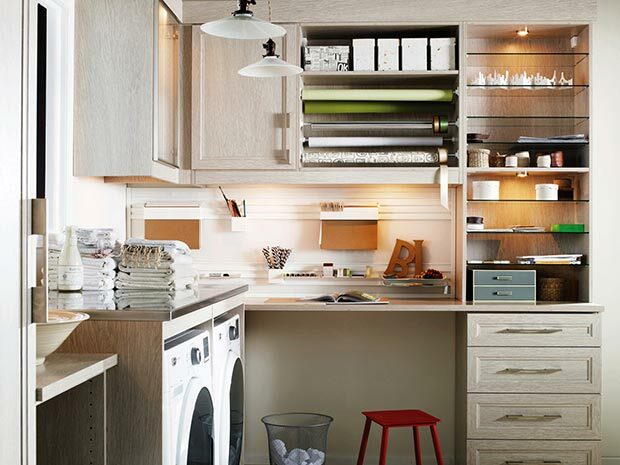 Blending work with creativity, this room allows for both well-appointed storage and a functional layout. Classic White finish paired with light blue walls creates a fresh color palette. Classic White 5-piece Shaker door and drawer fronts contribute to the seamless look. 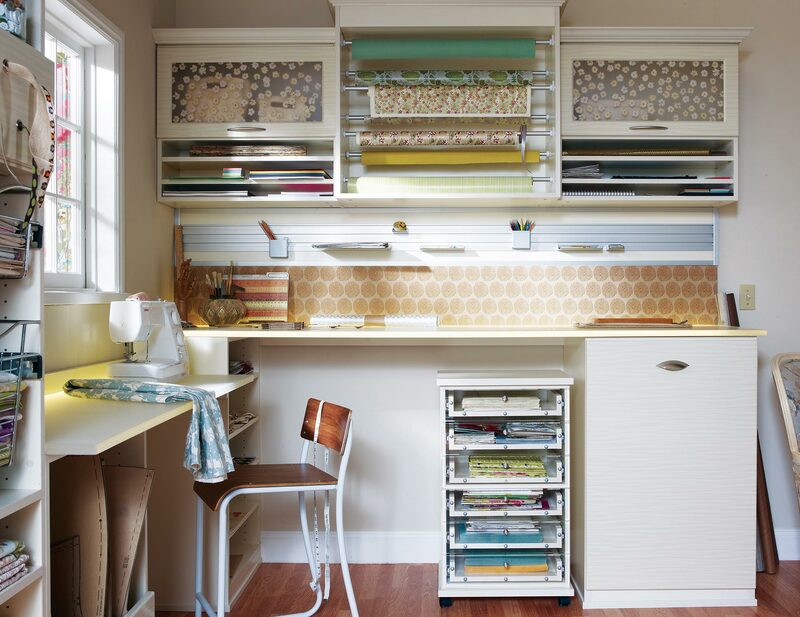 Fusion track wall system and accessories provide a home for craft supplies. Freestanding desk offers an additional work space. Crown molding detail lends a built in look. A well-lit work desk is perfect for seeing every detail, making crafting more efficient. Classic Ivory finish sets the tone for a soft color palette. High-gloss doors with Ecoresin inserts add a decorative touch. Ivory engineered resin countertop is lighted for an illuminated glow. Fusion track wall system with office accessories provides an easy-access place for tools. 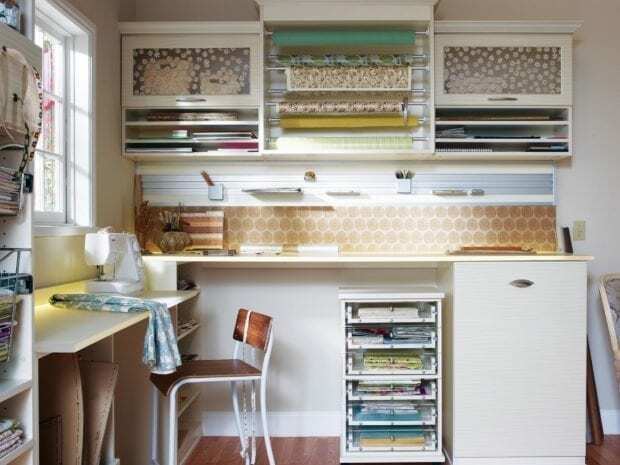 Ribbon holder drawer, pull-out wrapping paper drawer and fabric storage keep supplies organized. 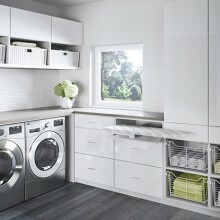 Chrome pull-out baskets create easily accessible storage. Multi-height work spaces offer different working environments. Crown molding detail lends a built-in look. 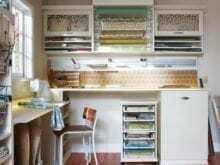 Lighted countertops and specialized storage transform this room into a keepsake-maker's dream space. Classic Ivory finish creates a neutral backdrop for crafting. High-gloss doors with Ecoresin inserts provide concealed storage. Fusion track wall system creates storage for office supplies. Chrome pull-out baskets provide flexible storage. 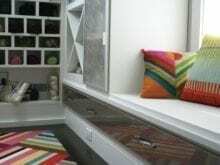 Designated fabric storage creates easy access. Pull-out wrapping paper drawer and ribbon holder drawer keep gift wrapping supplies organized. 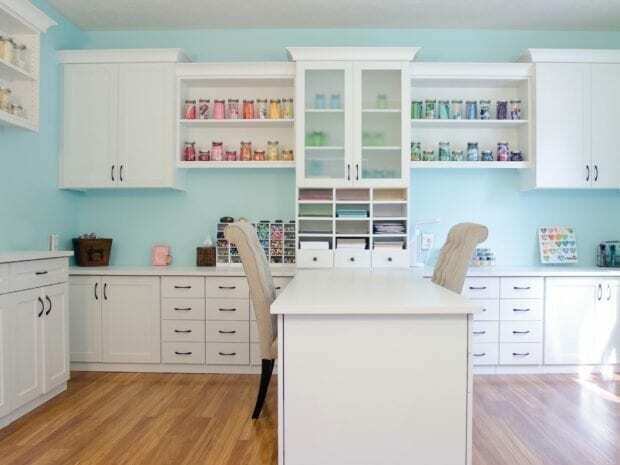 Multiple work spaces and ample storage blend function with flair in this well-organized room. Lago® Adriatic Mist sets the tone for a neutral palette. Fusion track wall system with accessory hooks offer storage for crafting tools. White high-gloss slab fronts add texture and contribute to the modern feel. Vertical shelving creates storage for books. Fabric board creates a place to pin inspiration. Drawers and cabinets provide concealed storage. Brushed Aluminum decorative hardware accentuates the neutral palette. Innovative shelving and high-end design features elevate this creative space while providing necessary organization. 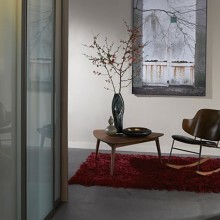 Lago® Bellissima White finish creates a minimalistic and neutral backdrop. Aluminum frames with Wisp Silver Ecoresin inserts provide concealed storage. Gloss wired Mercury drawer faces add texture and interest to the minimalistic aesthetic. Unique yarn storage keeps supplies organized. 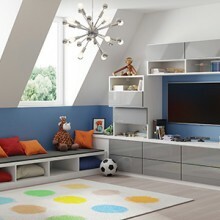 Cubbies create storage that is easily accessible. Adjustable shelving provides flexibility for changing needs. Tiered top shelf accommodates the sloped ceiling. 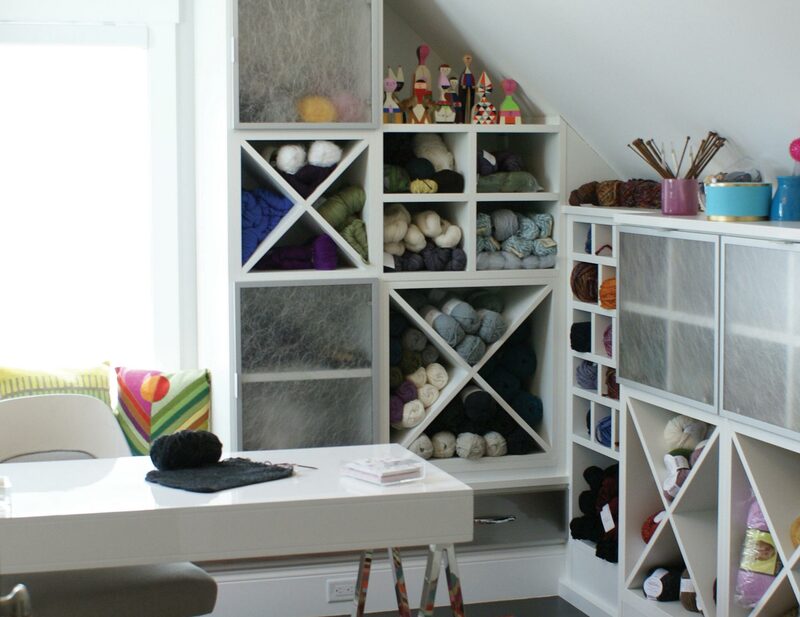 A large work space and multiple storage options inspire creativity and order in this well-designed room. Lago® Bellissima White finish paired with light aqua walls creates a fresh, cheerful color palette. 5-piece Shaker door and drawer fronts contribute to the seamless, monochromatic aesthetic of the cabinetry. 5-piece doors with Satin glass inserts softly conceal storage. Brushed Aluminum decorative hardware coordinates with the fresh palette. Integrated workbench creates a designated project space. Brilliant pops of color, ample counter space and loads of specialized storage inspire creativity and organization in this space. Classic White finish provides a neutral backdrop for bold and colorful accents. Deep texture slab door and drawer fronts bring texture and depth to the space. Cubbies for wrapping paper create easy storage. Glass countertop adds a sleek, reflective accent. Gloss White door and drawer fronts provide texture and visual interest to the design. Thoughtful design and details create multiple functional spaces that add purpose to a small room. Adriatic Mist finish creates a neutral, textural backdrop. Modern miter door fronts add a polished look that is both elegant and contemporary. Brushed nickel hardware refines the design. Puck lighting illuminates work spaces and highlights display items. Glass shelves showcase collectibles and tools. 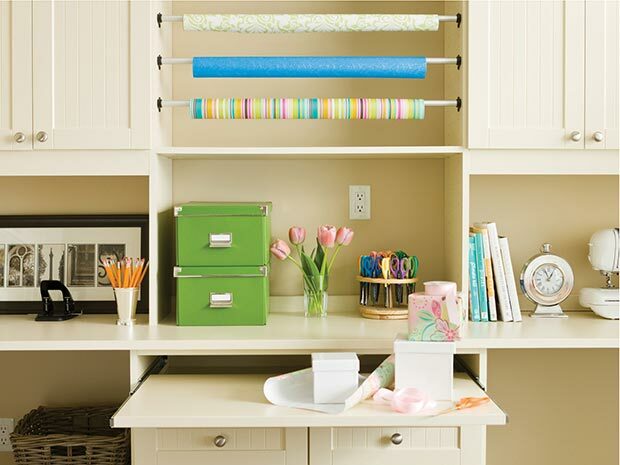 Wrapping paper rails provide easy access and an orderly display. Fusion track wall system with accessory hooks offer storage for supplies. A magnetic marker board allows easy access to notes. An aluminum door frame with etched linear glass adds design interest. Thoughtful features make this beautiful craft space exceptionally functional. Classic Ivory finish provides a neutral, timeless backdrop for a practical space. Shaker Elite doors lend a traditional aesthetic to concealed storage. A pull out shelf quickly creates an additional work surface on demand. Your designer will help you choose the right finish – dark or light, smooth or textured – to accent your décor and refine your style. 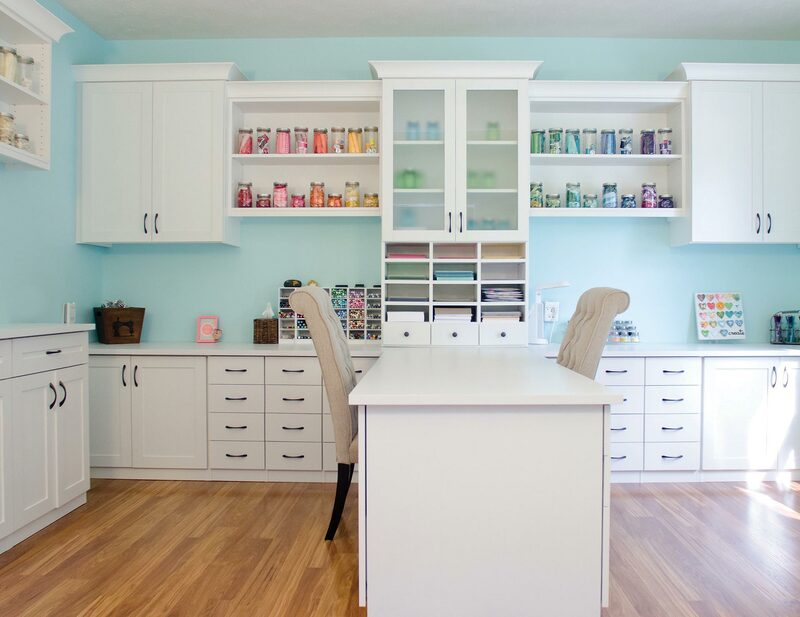 From custom workspace accessories to specialized storage features, our craft room solutions can be personalized to your needs, allowing you to focus wholeheartedly on creativity. When we customize a design for you, we consider your space, your style, and your budget. We offer a wide range of quality options so we can satisfy each of our customer’s needs.